Fundraising cards have been one of the most popular products for raising money for decades; church groups, school organizations, and sports organizations like soccer association and soccer Leagues have long relied on these profitable cards for a number of reasons. The economy has been weak for more than five years now, and many non-profit groups simply cannot rely on donations from businesses who may not have money or other goods to donate. That means that many organizations are having to find ways to raise the funding they need, which isn’t too difficult given the huge number of products designed for fundraising purposes. However, if you are looking for something that is easy, profitable, and can help your group collect the amount of money you need quickly, consider fundraising cards. It’s a product that sells easily. We’ve already mentioned the state of the economy, and how it affects donations. On the flip side of the coin, many customers simply won’t buy candy bars, jerky, and other “non-necessities” for the same reason – they don’t have money to waste. Fundraising cards offer the customer real value, a way to save money on those things they spend money on regularly, regardless of economic conditions – food, hair care (cuts, color, etc. ), car maintenance services (an oil change or tune-up), etc. Because the holder of the card enjoys discount savings on a wide variety of products and services at merchants in their own local community for an entire year, they can perceive the card’s value in terms of great savings over a long period of time. This makes for easy sales, unlike products people don’t really need or hesitate to spend money on because they feel the purchase is frivolous. 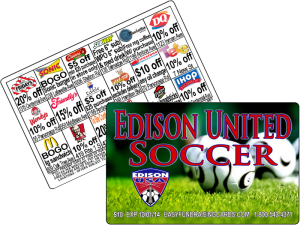 Soccer Fundraiser cards are effective used on their own, or in combination with other methods your group uses to raise funds. If yours is a soccer group, you probably regularly hold bake sales, car washes, and pancake breakfasts to raise money. Why limit yourself, when you can raise far more money by adding these value-packed cards to the mix? Offering them up while the ladies are hosting a bake sale or the teens participate in a car wash is a great idea. However, used on their own the results are still incredible when compared with other methods used to raise funds. The profits are truly amazing. Unlike most other products, fundraising cards offer incredible profit potential; the larger your group, the higher the profit margins as they rise incrementally depending on the number of cards you order and sell. Even small groups of about 25 will earn 50%, which on a $10 card is still great – and given the ease of selling, raising a substantial amount of money doesn’t take long, or involve a lot of work. If you have 50 or 100 in your organization you can expect to raise between $3,500 and $10,000! Try accomplishing that with candy bars, popcorn, or other items commonly used to raise money, and you will see that not only does it take far longer, the effort involved is substantial. With these amazing little credit-size cards, profit margins can go above 100% due to the fact that your group gets 200 cards free with every 1,000 ordered. These are just a few of the reasons fundraising cards for soccer are the best product for raising money. The best way to find out just how profitable and effective they are is to try them for yourself!